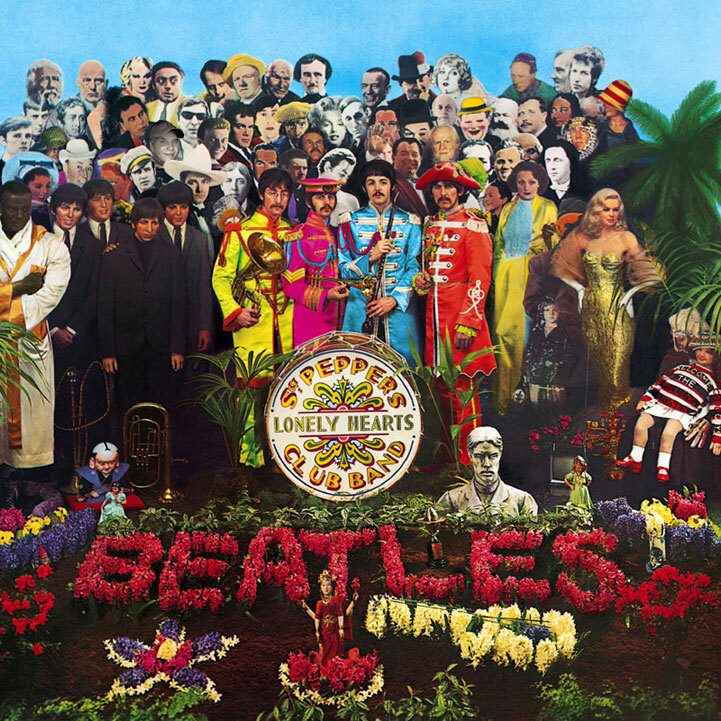 Paul McCartney requested the design be as stark a contrast to Sgt Pepper’s day-glo explosion as possible… he got it! Hamilton intended the cover design to resemble the “look” of conceptual art, an emerging movement in contemporary art at the time. 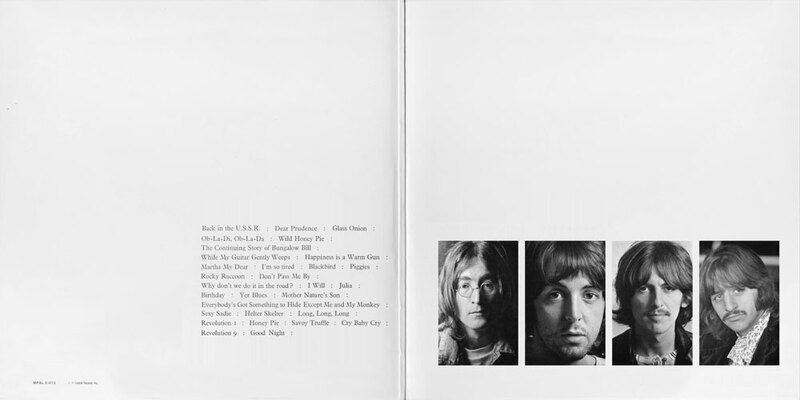 The album’s inter-gatefold opened at the top originally, not the sides. 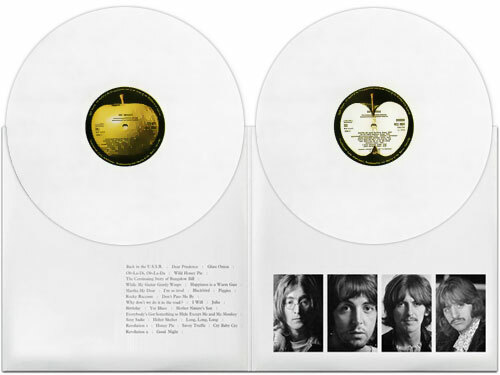 Most assume the stark white cover that adorns The Beatles’ ninth LP was the brainchild of John Lennon or Yoko Ono. It’s minimalist and conceptual art influence was definitely in step with the pair’s avant-garde leanings. Lennon himself had utilized both a white canvas and white balloons in his “You Are Here” exhibition held July of that year at the Robert Fraser Gallery. He had landed the job via mutual friend and gallery owner Robert Fraser. In the early stages of his design, he proposed that the white sleeve be augmented with a coffee cup stain, that was deemed “too flippant”. He then suggested that the cover be impregnated with apple pulp, in homage to The Beatles’ company Apple Corp, this too was considered “impractical” and was also rejected. In the end the revolutionary nature of Hamilton’s design was in it’s simplicity. 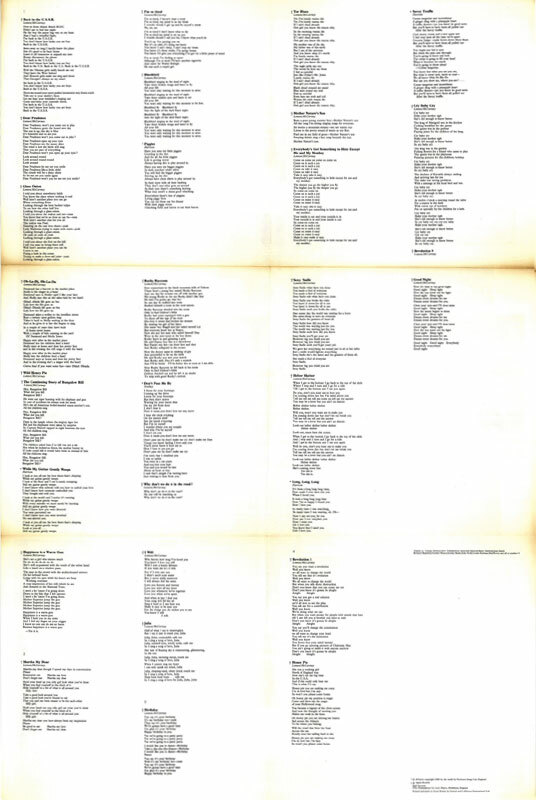 The inter-sleeve was a bit more conventional, with song titles listed on the inter-left gatefold, on the lower right, and four black and white portraits on the lower portion of the inter-gatefolds right side. 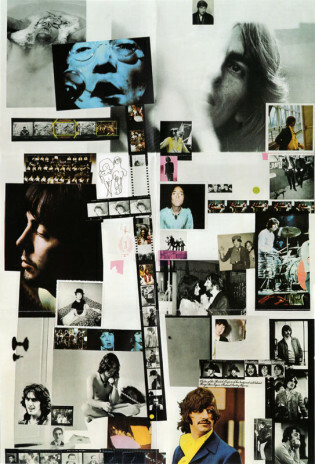 The poster, with its collage of snapshots and contact sheets put together by Hamilton, along with the color portraits of the individual members, was also included with the album. 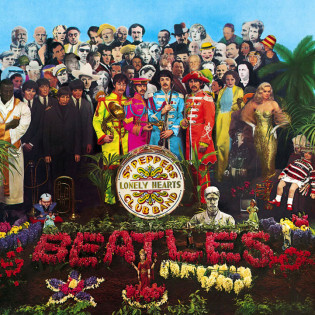 As the music contained within was less a collaboration and more the result of three distinct songwriters in John, Paul and George, so too did Hamilton’s design, with it’s utilization of solo shots of each band member, focus on The Beatles as individuals rather than a group. 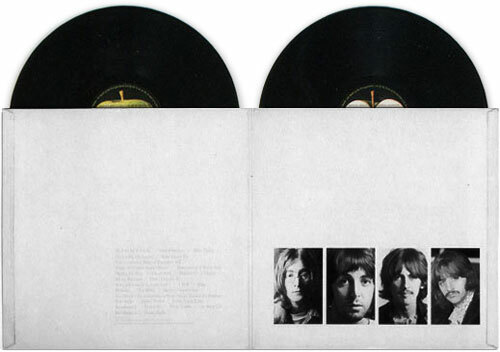 The first two million copies of the LP also had an individual edition number. Copies were numbered, the same system used at all 12 pressing plants (so there are 12 1s, 12 2s, etc). Also, due to a dispute over banding (where the space between songs is visible on the record disc), some copies are banded and some aren’t – even between copies pressed at the same plant. John got 00001 “because he shouted the loudest” recalled Paul. 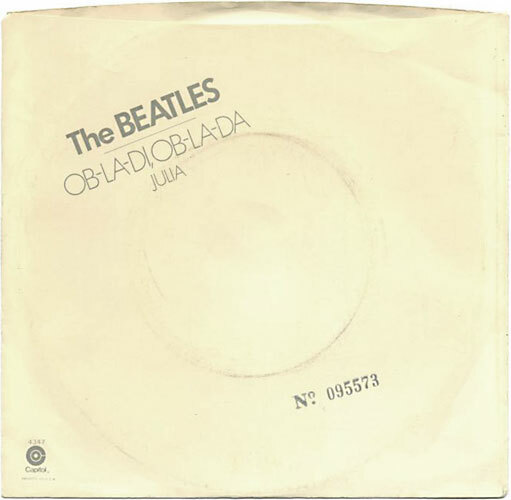 No singles were issued from the album until 1976, when “Ob-La-Di, Ob-La-Da” was released as a single with “Julia” as the B-side. 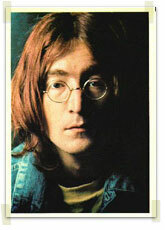 The album included a set of four color photographs taken by John Kelly during the autumn of 1968. 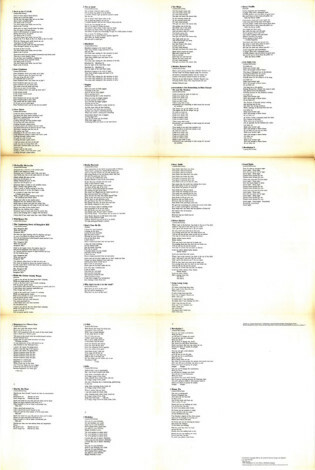 Richard Hamilton also came up with the montage idea for the large free poster, which included the lyrics on it’s rear. Original copies of the album also had a top opening sleeve, and black paper inner sleeves. 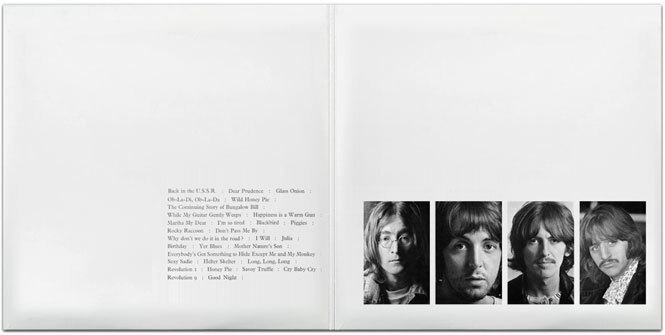 The albums design and art direction are officially credited to Richard Hamilton, Gordon House and Jeremy Banks, with photography by John Kelly. Hamilton’s original sleeve design has been altered numerous times over the years to adjust to the various media used for its release with separate designs created for vinyl records, reel-to-reel tapess, 8-track tape, cassettes, compact disc and mp3’s. 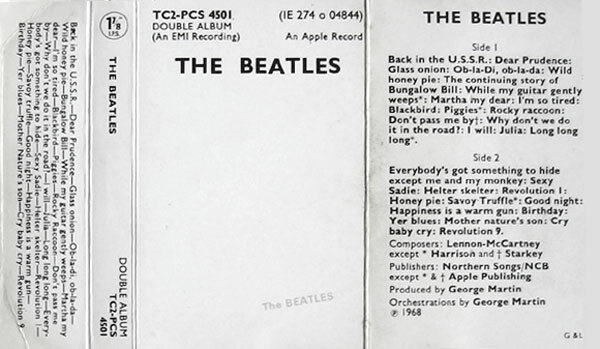 The US version of “The Beatles” did not feature black sleeves as the UK version did, and the four photos were smaller. Reports indicate that Capitol had compressed most of the album but George Harrison discovered this and set things right, although due to some mechanical error there is audible evidence of this during “Cry Baby Cry”, near the line “all the children”. 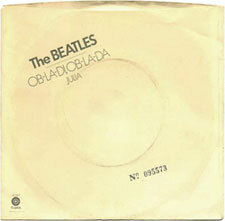 Later vinyl record releases in the U.S. showed the title in grey printed (rather than embossed) letters. Early copies on compact disc were also numbered. Later CD releases rendered the album’s title in black or grey. 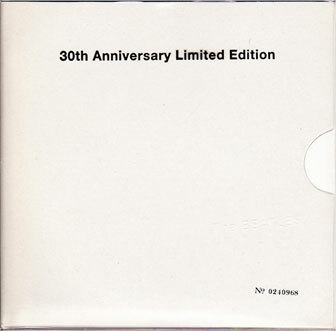 The 30th anniversary CD release was done to look like the original album sleeve, with an embossed title and serial number, including a small reproduction of the poster and pictures. 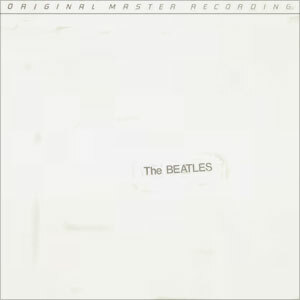 On January 7, 1982, Mobile Fidelity Sound Labs released the album with a non-embossed unnumbered version of the cover art containing an ORIGINAL MASTER RECORDING banner across the top. Neither the poster nor the portraits were included. The labels to these discs were white with black text and the Capitol dome logo at three o’clock. The MFSL discs were made with Super Vinyl, providing an extraordinary quiet playing surface. Although MFSL leased the album from Capitol and used the company’s sub-master, fans believe they sounded superior to the standard British and American pressings. The discs were stored in static-free, dust-free rice paper inner sleeves enclosed in an off-white gatefold with a reinforced stiff board that fit into the custom fabricated album jacket. 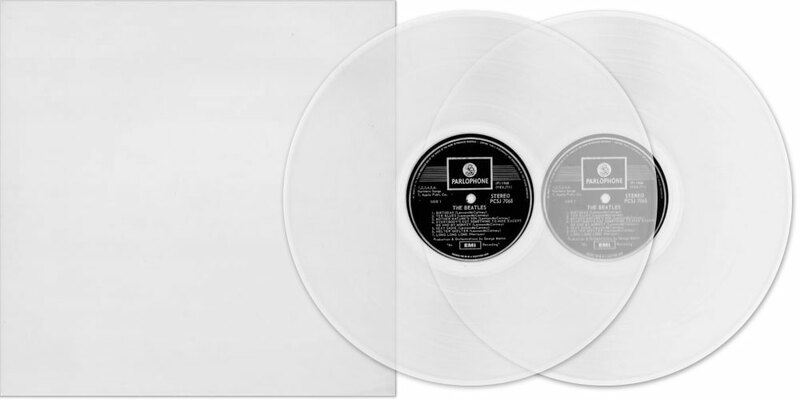 In 1985, EMI Electrola released a DMM (direct metal mastering) white vinyl pressing of the album in Germany, which was imported to the United States in large numbers. 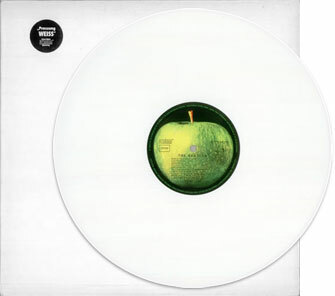 Another popular white vinyl pressing was manufactured in France. The 1978 Parlophone white vinyl export pressing and the German DMM pressing are considered by many to be the best-sounding versions of the album. This is due to the use of the famed Neumann lathe on the 1978 export pressing and the use of the DMM process on the 1985 pressing. 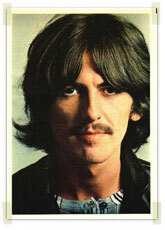 The album was was released on twin 8-track stereo continuous playing cartridges (3¾ ips) with the catalogue no.8X2-PCS 8501. The album was also available on 5″ reel-to-reel tape in 1968 with the catalogue numbers DTA-PMC 7067/8 (3¾ ips twin-track mono tape), and DTD-PCS 7067/8 (3¾ ips 4-track stereo) both these editions were packaged in a “jewel” box. The album was also available on 7″ reel-to-reel tape in 1968, Apple catalogue number Y2WB-101, (3¾ ips twin-track stereo tape), the entire album was placed on one 7″ reel. 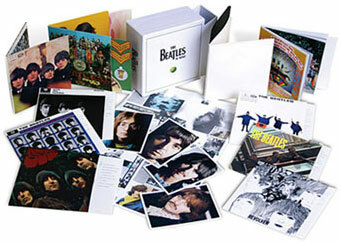 Prior to 1973 the album was released on stereo twin-cassette tapes (1⅞ ips) with the catalogue number TC2-PCS 4501. In November 1988 the double-album was re-released once again on twin cassette tapes (in stereo only) using the original catalogue number TC2-PCS 4501. This issue contained 2 cartridges individually numbered “8XW-160” and “8XW-161” in a black custom Apple slip-on title box. The 1976-1979 re-issue no longer had the Apple graphic on the outer slip-on box. This issue contained 2 cartridges individually numbered “8XW-160” and “8XW-161” in white custom Apple slip-on title box. This 7″ Reel to Reel issue contained edited versions of Glass Onion, Don’t Pass Me By, Yer Blues, Helter Skelter, and Revolution # 9, and omits Can You Take Me Back. 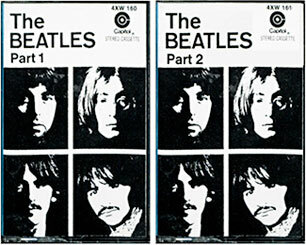 The sound quality was enhanced on these blue-box versions when the tapes were recorded for playback at 7½ ips. This made for twice the tape length and a heavier reel for the same amount of musical material. 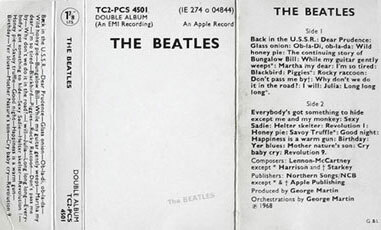 The ‘White Album’ cassette originally came in a cigarette type packet/card box. In mid-1971 it was re-issued without the box and used this standard inlay design. 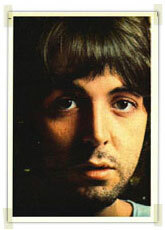 The cassette was re-issued in the UK in 1976. Known as the ‘Gold Re-Issue” early versions used metallic gold paint. Bar-coded gold inlays appeared later on around 1985.
note: Gold inlay’s were originally accompanied by the same old yellow labelled cassettes, but these soon gave way to white labels. 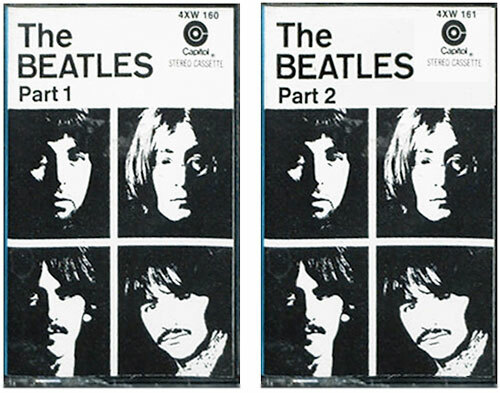 Direct blue inked cassettes began to appear around 1977, these being the first Dolby versions of the Beatles albums. Below: The most elaborate cassette re-issued yet was released in 1987 as a XDR [eXtended Dynamic Range] Cassette. 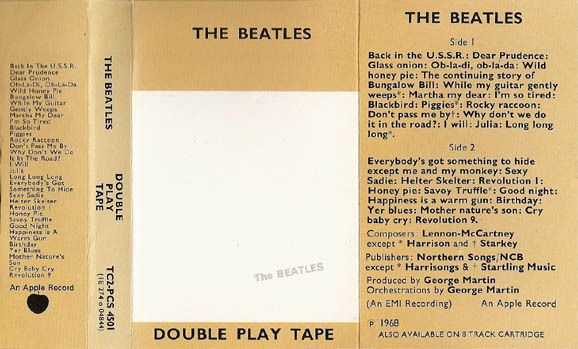 The “XDR Quality System” tapes were the final generation of UK Beatle cassettes, they were issued during the same year that the Beatles albums were first issued on Compact Disc and, for the first time, all the cassettes presented the tracks in the correct running order*. The XDR inlays were mainly white but included all of the original artwork found on the back covers and gatefolds of the vinyl editions. 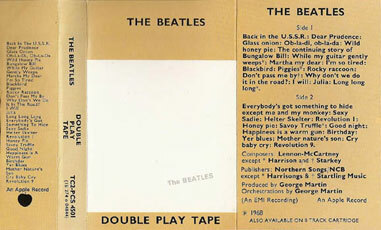 The White Album, which had previously been issued as a single “Double Play Tape”, was now issued on a pair of cassettes (so like the vinyl version, it was now spread over 4 sides). 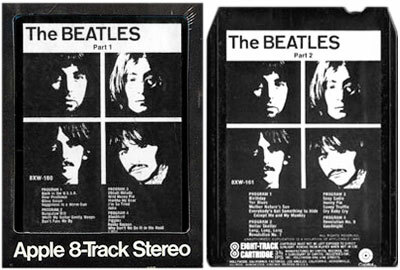 The XDR tape shells were clear plastic with details printed in white ink (including a Parlophone logo) and the cassettes were all housed in completely clear boxes (front AND back). 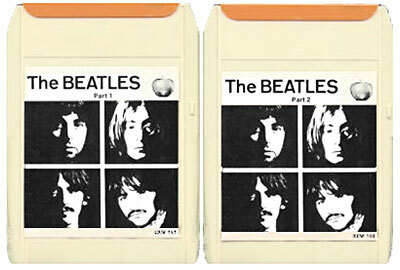 As with the CD’s, original XDR tapes (including The White Album through to Let it be) did NOT include any Apple logo’s on the inlay or on the shell, it was only from around 1992/93 that re-pressings of Beatles cassettes and CD’s began to include the full colour Apple logo. By 1993 Compact Discs were outselling cassettes and with the advent of CD-R and MP3 players at the turn of the Millennium, the cassette era came to an end. On September 9th, 2009 Apple Records in conjunction with Capitol Records and EMI released the long awaited completely remastered Beatles catalog. 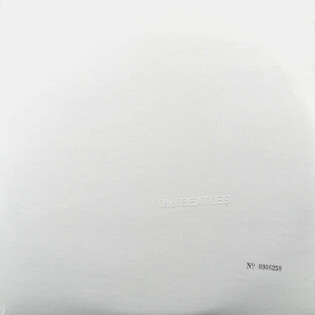 The “White Album” was considered by many the centerpiece of this release. Both the mono and stereo versions of the ‘White Album’ were re-issued in their own distinctly designed packages. 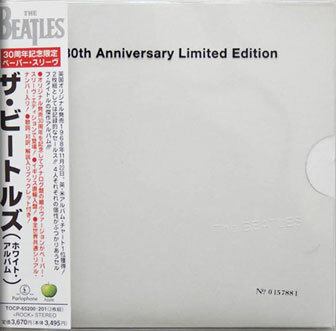 The stereo version was available separately for purchase, however the mono version (shown below) was only available by purchasing the complete limited edition mono box-set. For these new releases, the slipcover holding the CD digipak was embossed in much the same style as the original sleeve (though lacking a serial number). 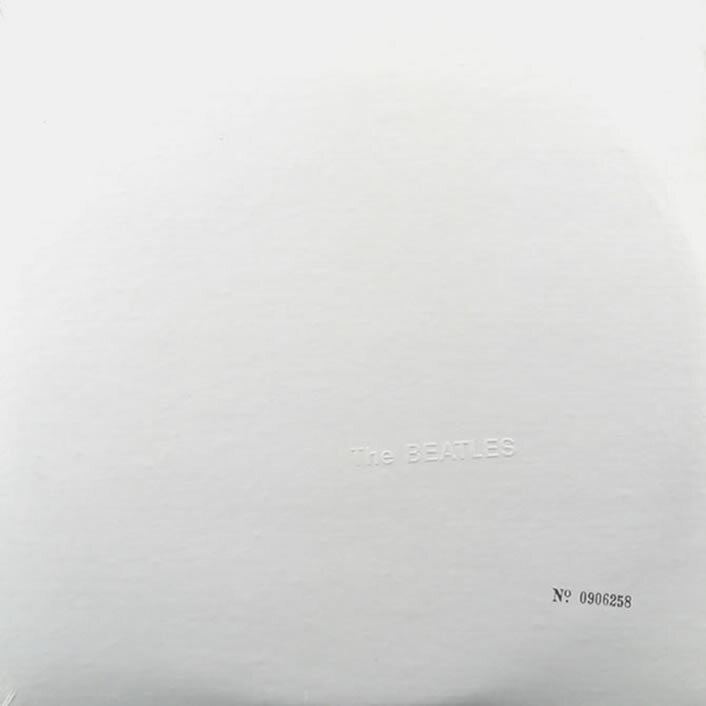 September 9, 2009: The limited edition Beatles mono box-set with the “White Album” as it’s centerpiece was release by Apple Records. 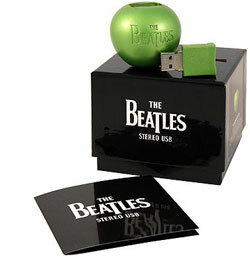 On December 7, 2009 EMI Music and Apple Corps Ltd. released the entire Beatles catalog on a special limited edition (30,000 seems to be the total number of Apples being made available) 16GB USB stick. Included on the stick are the re-mastered audio recordings for The Beatles’ 14 stereo titles, as well as all of the re-mastered CDs’ visual elements, including 13 mini-documentary films about the studio albums, replicated original UK album art, rare photos and expanded liner notes. The USB Apple release was met with both joy and disappointment from diehard Beatles fans. On the one hand, it’s a very cool piece of Beatles merchandise, it’s a limited edition and it’s the entire catalog, which kind of makes it a must have. On the other hand, it costs £200 in the UK and $279 in the US, which is pretty pricey. On November 16, 2010 the complete Beatles catalog finally became available for downloading and purchasing from the iTunes music store. At last, The Beatles music is accessible for a new generation of music fans, bringing them firmly into the 21st century. 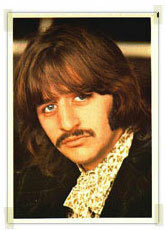 For many Beatles fans young and old this event has been a long time coming. After many years legal wrangling between EMI, the Beatles own company Apple, and the ‘other’ Apple behind iTunes have prevented the bands back catalogue from been available to download.